Monday was the last day of school over here. Such an exciting time for students and teachers!!! A time of adjustment for parents, I imagine. For janitors, it doesn’t mean much. We’re still working, we’ll just be doing different (but just as physical, if not more so) tasks. And, it means we’ll be switching from working nights, to working early. A lot of times, people (outside of work) ask me if I work during the summer. They assume that I don’t. For the record: school janitors work all summer long. How else would the school look all shiny and new on the first day of school???? Little tiny elves?!! This has historically been the hardest time of year for me. Everyone is so excited about the nice weather and their upcoming freedom. Teachers are clearing out their rooms in anticipation of new stuff they ordered for next year. I start getting really emotional about everyone leaving. I start trying to save as much of the stuff they are throwing out. I start fretting about being ripped away from my routine, and having to work closely with my co-workers all day, every day. I start isolating as much as I can get away with. I know this is some strong language for what seems like no big deal, but it really has felt this extreme for me. It’s been getting better the past two years. Like everything else in my life, I’m starting to be able to handle it easier. I feel more at ease with my co-workers, and the idea that I will actually be working with them. I chat with teachers about their summer plans. I don’t try to save everything they throw away; I’m becoming more selective. As a side note, anything I do get out of the trash, I immediately create a strong bond with it, for some reason. Stuff from trash is much more valuable, often, than stuff I choose to buy. Not sure why. 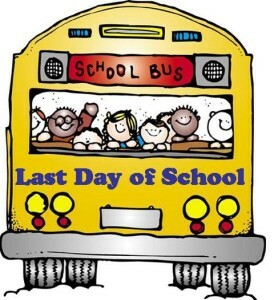 But I still can’t let myself get swept up in the energy of the last day of school. I don’t make an effort to say good-bye to all the kids or anything. What they do at our school is, Kindergarten through 4th grade students all go out early and position themselves out on the bus loop, so that when 5th graders head out to get on their buses, they get a big send-off. Then everyone boards their bus, and all the buses take two laps around the bus loop as all the staff cheer and wish them farewell. And kids are allowed to hang out the windows, just this one time, and everyone is yelling and cheering and crying. I cannot be there for that. Maybe one day. I just stay in the building and dump garbages, because it is too intense to be a part of that. And really that’s it so far, which is a very good thing! The past few years, there have been times of huge upheaval. Asbestos removal about 6 years ago, massive room changes about 3 years ago, new carpet installation 2 years ago. Anything like this, and teachers toss out soooooo much. And I respond in a frenzied fashion. I cannot see useful things go into the dumpster. This year feels so smooth and relaxed, in comparison. I am glad. lunch boxes, so many lunch boxes. I’m always in the market to upgrade, haha. a long long list of art supplies and books, calculators, cameras, just… stuff. This time around, I am ready to try and enjoy the summer. Those cheese strings scare me o.O I’ve had Jeremy come home with cheese strings after a locker clean out when I knew he hadn’t brought any to school in several months. They still looked the same, just were a bit soft. Those things could be half a year old. Judging from the time Jeremy drank several glasses of almost solid milk (because he didn’t know that wasn’t a good idea), I’d suggest having several bottles of ginger ale and a club pack of peppermint tea ready. From what I remember there was about a 12 hour countdown before all hell broke loose. Oh, man, sorry to hear about Jeremy and the solid milk. I’m glad you commented on this because actually I have a bit of an iron stomach complex, haha. I just keep testing myself and testing myself, and still have yet to have a serious bad-food digestive issue. The string cheeses (which, although were expired, have been refrigerated up until being in the garbage, as far as I know) are nothing! I’ve already eaten 4 of them with no problems, haha. I also enjoy eating expired yogurts, even if they’ve been unrefrigerated for maybe…. half a day. Not multiple days though. And I’d pass on the chunky milk. Haha. I am happy to hear about this “dumpster diving” side of your personality. Four years ago, we sold the house that we had lived in for ten years. A friend who hauls junk hauled two entire box trucks of “art supplies” also known as “dumpster dived stuff” from our garage. I saved about a half a truck worth of the best stuff. In my defense, I really do make art out of this stuff. Also in my defense, our house is decorated with discarded or bargain basement stuff. People do not believe it when they see the house. LOL… I’m pretty sure those cheese strings could count as a fatal flaw. The coat and ipods sound amazing though. I’m loving these comments! String cheese turned out to be a tasty treat, and not a fatal flaw. One day though, I may end up taking a wrong turn with the food… I’m just pushing my luck…. You are so on the mark!!! It is totally a superpower AND a fatal flaw. I both love and hate the fact that I am drawn to dumpster diving. I’ve found awesome things, and it’s just a really warm and fuzzy feeling, sorting through trash. But it’s also led to huge amounts of stress and anxiety at times. And huge piles of things I do not need. I’ve developed a reputation… Like, for example, I was spending a little too long at the dumpster just yesterday, and my supervisor saw me from out the hallway window on the 2nd floor, and shouted down to me, “Leave it. Leave it. Leave it.” She means well… no one wants to see a hoarder in training, haha. and yes, dumpster diving will definitely be in the comic book! I don’t like to beat jokes into the ground, but I can’t help but to keep thinking of the JQ super hero comix whenever I read your blog. JQ could even make a trip to the philly transhealth conference to recharge his superpowers. Lots of possibilities. The next time that you feel bad about dumpster diving, remember this story. My friend Eddie was digging through piles on big trash day about 10 years ago, and found two little paintings on wood panels. He looked up the name of the artist, and it was in the catalog as a known artist in the early 20th century. Both paintings were of well known NYC landmarks. They paid about $1000 to have the paintings restored. In the end, one painting brought 80,000 at auction and the other got 30,000. No one can criticize Eddie now.